Each month, the dive team engages in specialized training to prepare for the many different conditions that may be encountered on a search. 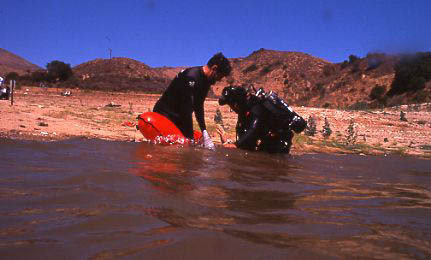 The team believes it is important to maintain a high level of proficiency in its diving and search skills. Three teams of four were organized to respond to different call-out scenarios. Each team needed to choose a team leader (Dive Master) and demonstrate efficiency in planning, organization and search procedures. 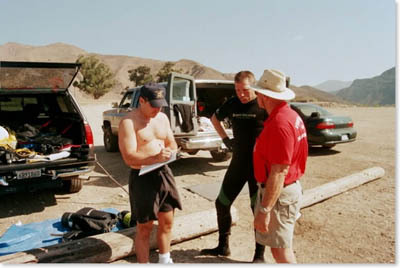 A senior Dive Team member was assigned as an evaluator for each group. 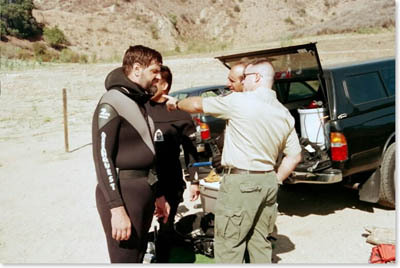 Mike Fisher was designated Dive Master for his team. He conducted an interview with one of the witnesses. After Mike gathered information he briefed his team and made initial assignments. John Sullivan documented information and procedures for his team. Evaluator Dieter Schwake observed and closely shadowed the team's progress. Sullivan and team checked in with Larry Fuller, the Incident Commander, for the evaluation. James DeLeon used arm signals to position a swimmer. The positioning was accurate thanks to a good "point last seen" determined from the witnesses interviewed. 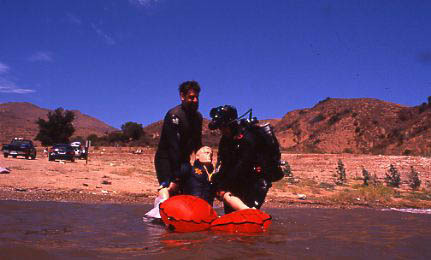 Divers gave up on the body bag provided for the practice. "Water body bags" that are open on both ends and only held closed by small Velcro tabs were found to be insufficient for the job. During an actual call-out, victims would be handled much more discretely than the crash dummy used in the photos on this page.